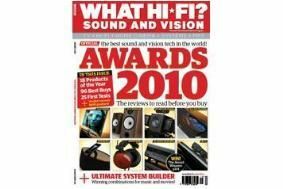 Awards 2010 issue on sale now | What Hi-Fi? From the best 3D TVs, Blu-ray players, home cinema amplifiers and speaker packages, to the latest in cutting-edge streaming technology, iPod docks, audio systems and conventional hi-fi, we've picked the best kit for your cash. Our bumper Awards issue goes on sale today, packed with 25 exclusive First Tests, nine of which are first-time Award winners. Drool over the superb photography, check out the tech specs and don't even consider buying that new TV, hi-fi or home cinema system before you've studied the magazine from cover to cover. We've also got an amazing competition for you to enter, in which we're giving away 17 of our Products of the Year. And if you happen to be in Manchester this weekend (Oct 16/17th), don't forget to visit us at the Manchester Home Entertainment Show, taking place at the Renaissance Hotel. We'll have all our 2010 Products of the Year on display, and the entire test team wil be on hand to help you with your hi-fi and AV queries. See you there!